Republican Chris Christie defeated Jon Corzine in New Jersey's gubernatorial election on Tuesday. I think it's time I weighed in on the New Jersey election results. Some in the GOP (Chairman Michael Steele, for example) are claiming "historic" victories. Others, most notably Democrat Nancy Pelosi, are doing their level best to completely ignore the gubernatorial election results. That's right, Nancy. If you close your eyes, it never happened. The punditocracy is going to town over this. First, most of us didn't even realize we were going to get the gift of politics until we turned on our TVs last night. It's like finding a post-season All Stars game on your TiVo when you didn't even know one was scheduled to record. Talking heads. Pontification. Spin. It's enough to make a guy geek out all giddy with delight. Back to New Jersey. First off, I'm a Jersey boy. I grew up in the Garden State and lived there on and off until just a few years ago, when my love for my wife (and her desire to live somewhere without winter) overwhelmed my deep connection with my native soil. I'm telling you, it's weird down here in Florida. The Wal-Mart greeters actually greet you, sometimes even wishing you a "Blessed day". Back home in New Jersey, you never made it past a Wal-Mart greeter with anything warmer than "What you lookin' at?" I miss New Jersey. But I digress. I want to talk about why Democrat Jon Corzine really lost to Chris Christie. First, let's be clear about Corzine's history: he was a banker. And he wasn't just a banker, he was the banker. Jon Corzine was Chairman and CEO of Goldman Sachs until the late 1990s. Yes, that Goldman Sachs. And if you don't think New Jerseyians aren't pissed off by the banks and, in particular, Goldman Sachs, you don't know my fellow citizens. So, completely separate from the issue of whether Corzine had been a good governor (and all indications are a resounding "meh"), he had one very serious point against him. He was was a super-wealthy banker running for office at a time when super-wealthy bankers should probably just be running and hiding. And then there's the weight thing. And here's where I'm convinced he lost the election. Jon Corzine lost by 4.4 percent to Chris Christie, a man who is by any measure big-boned. 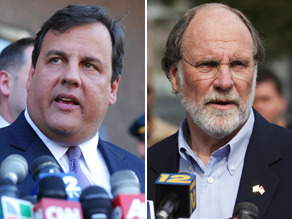 Corzine lost to Christie by just about 101,659 votes. In other words, he lost by the population of a mid-sized New Jersey town. Corzine has made something of a campaign issue over Christie's weight, even to the point of running a campaign commercial accusing the heavier candidate of "throwing his weight around". The dig was lost on nobody and was a matter of heavy press coverage for quite some time during the election process. The thing is, we New Jersey folk don't take being insulted lightly. I'm a big guy and so are a lot of New Jersey citizens. Sure, there's some svelt former bankers running around the Garden State, eating up all those yummy Jersey-grown organic veggies, but New Jersey also has its fair share of rotund (and proud of it, you gonna make something of it?) citizens. So here you have a fat cat picking on a fat dude. Out of the 2.2 million or so New Jersey residents, could there possibly have been 100,000 or so who didn't vote on issues and didn't vote on party, but voted because they were simply pissed off about the fat ads? New Jerseyians who vote because they're pissed off? If New Jerseyians do one thing really well (and we do a lot really well), we do "pissed off" with panache. Give us something to get righteously indignant about and we're happier than a pig in a poke. And that's what I think happened to Jon Corzine. I don't think it was a resurgence of the GOP's reach and influence. I just can't see the helicopter-hunting Sarah Palin carrying New Jersey in any way, shape, or form. I just think some New Jersey residents remembered how much they hated bankers like Goldman Sachs and remembered that Corzine was the banker at Goldman Sachs. And I think some other New Jersey residents simply voted an "Oh, no, he didn't" about the weight thing. I'm telling you. Don't piss off New Jersey. You'll regret it. Follow David on Twitter at http://www.Twitter.com/DavidGewirtz. The reason Corzine lost in the election is because he is a big liar. He promised to reduced our highest in the country property taxes and instead we are paying more. He promised to do away with corruption and well look what happened over the summer, 44 arrested for CORRUPTION. He tried to raise the road tolls by 800% . He is in bed with both the teachers union and the state workers union, and gives them whatever they want. We all wanted him to come in and fix the state finances but instead they are worse. As a Jersey Shore transplant for the last ten years I can tell you my voting against Jon Corzine (I would have voted for SpongeBob SP before putting Corzine back in office) had little to do with his wealth or his former job. It had everything to do with the fact the man has blatantly lied about his plans for running the state. It had everything to do with his arrogance in dealing with his constituency. It had everything to do with his hypocrisy in dealing with corruption. Other than that he was a good governor... oh, wait... that's right, he was a terrible governor. I was an Obama volunteer and am a staunch Obama supporter, but when it comes to my governor Chris Christie was a FAR better choice than having Jon Corzine again. Vote the (wo)man not the party and in this case the best (fat) man won. You "think" but you don't know. If people truly payed attention to details Obama wouldn't be president and the devilcrats would be no longer. As they reflect the wickedness of man. Sin-yes you can is how the devilcrats roll. I'm not saying this as a Republican, but as a human. The reason Obama can't make a war decision and is so caught up in healthcare reform is because he has no core, he is souless. Thank God for truth-to know Jesus is the way and stay away from men like Obama. It is true, that Pelosi feels she has got the ruby slippers and the magic that comes with them. However, her feeble attempts to look pleased and unconcerned only gave her the appearance of a deer caught in the headlights, the headlights of the run away train of our congress and the recklessness that thrives there and is thrown into the face of us each on a daily basis. It is time to till the garden, not just in the garden state but throughout each state, from east to west, from north to south and replant with frest and new hybrids. As well, the health care bill that is currently being forced upon us as the savior of the day is more like death calling.